Fiddle - tro khmer - Site de soundsofangkor ! 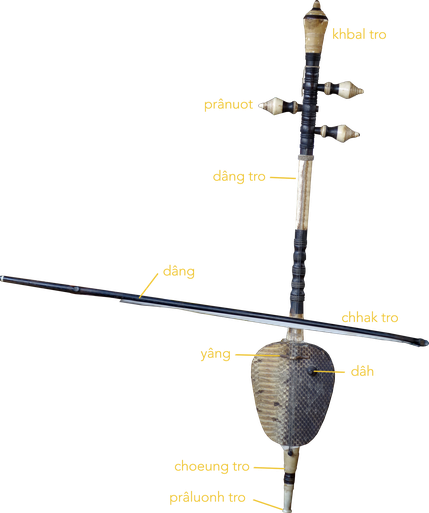 The tro khmer is a tricorded spike fiddle of the rebab family. It is impossible to date its appearance in Cambodia but it is possible that its introduction took place almost when the rebab made its appearance in Malaysia and Sumatra, that is to say towards the 15th c. Indeed, the Arab influence due to the contacts of Arab and Indian Muslim traders with the Far East dates from that time when Muslims set up trading posts around the Straits of Malacca and culturally colonize the Malay and Sumatra peninsula, then Java. Yet commercial contacts are apparently between the Malay sultans and the Khmer kings. Thus, much later, King Ang Duong (1847-59) will offer to the Sultan of Kelantan (North Malaysia) gongs still in use today in the Royal Palace of Kota Bharu and whose mention engraved in their bronze attests the origin. 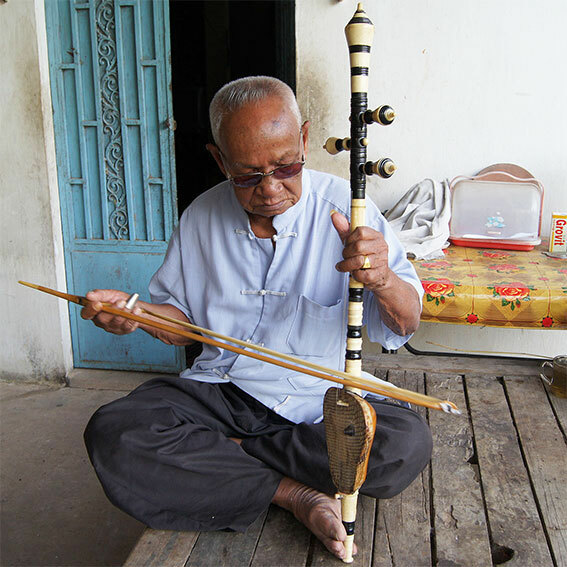 The Cambodians, however, consider the tro Khmer as one of their oldest instruments, and especially as one which can best help them express their musical sensitivity. It is perhaps from that the name tro Khmer comes from. But there is also the fact that among the rebab type, only the tro Khmer has three strings instead of two (in other countries), which may explain why the term 'Khmer' has been given to an instrument of foreign origin. Its height is 80 to 85 cm maximum. 1. 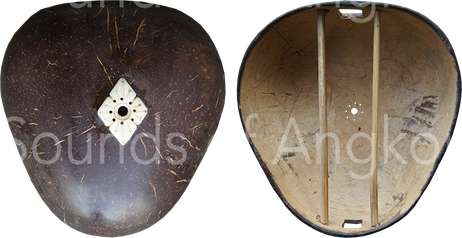 The khbal tro = 'head of the tro' of about 20 cm in length includes a hollow top and modeled on the lathe in which is hung a hook to hang the fiddle on the wall. Three side holes are provided for the pegs. At the lower part, a vertical bore inside the handle allows the strings to pass to the pegs which stretch the strings inside the khbal tro. The tro Khmer has no nut. When viewed from the front, the instrument has a peg on the left and two on the right. 2. The handle dâng or bâmpuong kandal = 'middle pipe' is hollow bamboo type russey chen of 15 cm long. Its two ends are surrounded by metal rings which thus prevent deformation of the orifices and serve to adjust the three elements together. The handle of the more refined tro Khmer are made of kranhung wood or formerly even ivory. 3. A last a section of wood made by lathe (15 to 17 cm) on which comes the sound box rolie tro. This one is made of a coconut picked ripe and hollow and then cut in the direction of its length about one third of its thickness. The nut is chosen carefully since the conserved part must possess a triangular shape and present two bulging parts called 'breast-shaped women'. The outer surface is then smoothed and then coated with varnish. 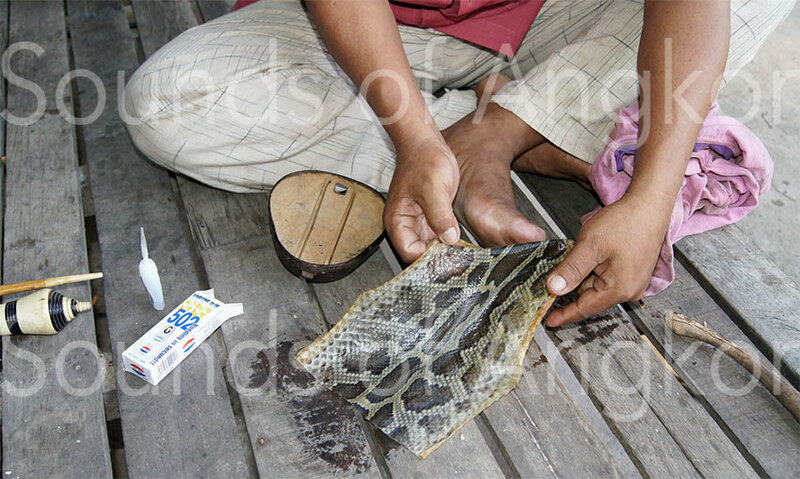 One chooses as a soundboard a special snake skin, that of the snake pramaoy dâmrey, a kind of python called 'elephant trunk' snake. This skin has the merit of not relaxing at temperature variations. Formerly it was bonded with anhchéy resin but today with cyanoacrylate glue. A small bridge (yâng) in a semicircle is carved out of soft wood and streaked with three fine stripes to fix the strings. When the tro Khmer is used, the bridge is only held by the tension of the strings; it is not glued, which allows the musician to remove it after use in order to avoid that the permanent support of the bridge in the center of the membrane does not gradually relax. 1. 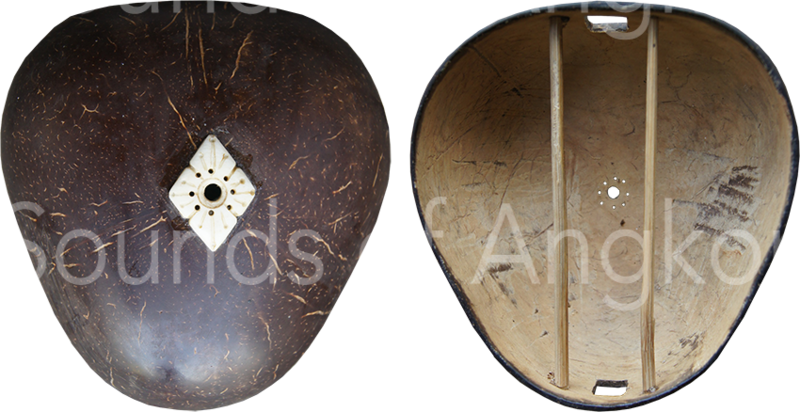 Exterior and interior of the triangle-shaped sound box in coconut. A seashell (dâh) also called sometimes khchâng hiech is glued to the skin itself resonance and serves as a mute. It avoids the tro Khmer a stamp a little too acid. Some musicians also use either a leather washer or a small ball of mixed resin and rice paste. A fifteen-centimeter spike (prâluonh tro), of the same wood as the handle, extends the lower part of the instrument. The spike adheres to the ground when the musician plays. This spike is crafted with a lathe in the case of quality fiddles. The strings are fixed to the spike with a small nail. The three strings - khsê aêk = sharp string, khsê kandal = medium string and khsê ko = low string - are tuned in fourth to each other or then in fifth for the low and medium strings and for the middle and sharp strings . The dimensions of the various parts of the instrument are established either from standards, or from cubits, lengths of hand, fingers, etc. The basic tuning is done by taking the pey ar oboe as a model because this instrument is a fixed-sound instrument. The bow (chhak tro) is of variable length, one defined by the length of horsehair that one can dispose of. The same wood is used as the wood to make the handle. Its length is around 35 to 40 cm. The handle is carved in the shape of a tail of naga and finished in motif of 'naga's head' where the hairs are attached. These are not stretched on the bow itself. The tension is produced by the fingers of the hand holding the bow, which makes it possible to vary the tension on the strings of the instrument. 2. The python skin moistened, ready to be glued on the sound box. 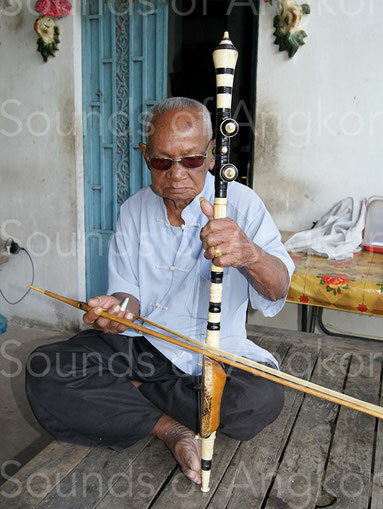 The technique of the tro Khmer is difficult: the musician must rotate the instrument on its spike while the bow remains practically always in the same plane (pictures 2 & 3). Thus the bow rubs the string brought on its hairs by rotation of the instrument. This technique is also used by the Malay musicians of Kelantan. 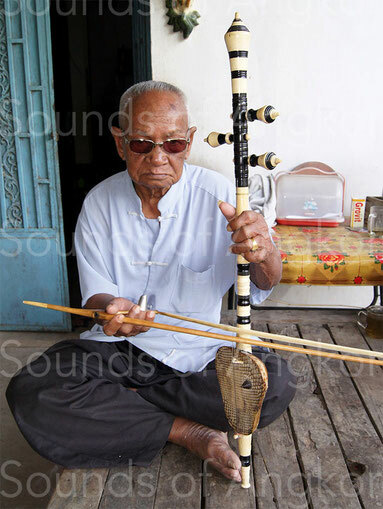 In the 1960s when Jacques Brunet wrote this article, he testified that: "The good tro Khmer players are rare today because few of them are able to obtain from the instrument the soft and warm sounds without which it is unbearable to listen. Indeed its sound box is small and the use of metallic strings produces sharp sounds that only very good musicians are able to avoid. The resonance of the tro Khmer is very short and one is far from being able to obtain the wonderful sounds of the Malay or Javanese rebab." Playing tro Khmer is said kot tro = from kot = rub. Master Sok Dutch showing two different playing positions. He rotates the instrument on its spike while the bow remains practically in the same plane.